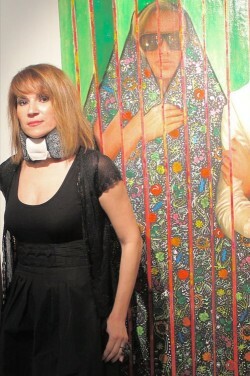 Artist Shurooq Amin poses next to one of her paintins at the exhibition, prior to the raid. At about 9pm police, responding to a complaint, arrived and began questioning people in attendance. At 10 pm officers from both the Ministries of Commerce and Interior arrived and inspected the paintings. They ordered the gallery owner to close the exhibition on the basis that the paintings were “pornographic” and “anti-Islamic.” The censorship prompted an outpouring of support for Shurooq and art freedom. Amin answered Sampsonia Way‘s questions about the closure of her exhibition via email. Is this the first time your work has been censored? How frequently does this kind of reaction occur in Kuwait? This is the first time this has happened to me. In fact, it is the first time in the history of Kuwait that an entire exhibition was shut down on the spot with no legal warrant. In the past, I’ve had Islamists come to my show in anger and huff-and-puff a little, but this is the first time they’ve blown my house down, so to speak. I heard you were under investigation. Are you expecting legal trouble? At the moment, I’ve heard nothing about the investigation. It’s all kept well under wraps. I’m hoping that’s good news. I doubt that they anticipated how the shutdown has backfired on them, with people from around the world supporting me. Were all the paintings recovered and put into a safe place? Will any of the paintings be exhibited elsewhere? On the night of the shutdown, the gallery owner stayed behind to move the paintings to a safe place. It was a good thing he did, because the next morning police came to confiscate the works. The curator of the gallery told them that all the works were sold and taken to private homes, so they couldn’t do anything about that. At the moment, the paintings are in a safe location. I don’t know about exhibiting them anywhere else, because they are being sold via telephone and email (the gallery owner keeps getting requests to sell). If there’s anything left of them, then I may show them; I’m not sure yet. How did you find out the reason for the shutdown of the exhibition? Do you know which specific paintings caused the complaints? What social “button” do you think is being “pushed” by these paintings? We never did find out exactly why or who shut down the exhibition. All we do know for a fact is that the person who ordered the censorship of the show was a well-connected individual, as the people that were sent to investigate and shut down the exhibition were secret service, not regular police. The reason I was given was that the paintings were “pornographic” and “anti-Islam.” Frankly, I think they use that excuse to censor anything that doesn’t appeal to them, or may influence the public to think for themselves. I do know that it was the message behind the exhibition that scared them, not any one particular painting. They did hover more obsessively, however, before a painting entitled “Diwaniya High,” which portrays three Arab men playing cards (can be interpreted as gambling), drinking from a Red Label bottle labeled in Arabic “Grape Juice,” and smoking suspicious looking cigarettes (getting stoned/pot). One of the men in the painting had a beard and was thus interpreted as an Islamist. For them, they saw that as blasphemous. However, I’m only exploring modern Arab society, and these are images from reality. They exist. Furthermore, Kuwait local TV airs shows during Ramadan which depict men getting drunk, stoned, and committing adultery, and no one bats an eyelash. 1) They fear a woman speaking out so openly and exposing their hypocrisy. 2) They want to control artistic expression. 3) They want to make an example of me, to prevent any brave thinkers out there from even contemplating doing what I did. 4) They fear my influence, because my shows in Kuwait are always anticipated well in advance, I have a solid following on Twitter and Facebook, and my opening nights are always packed. Kuwait society enjoys a great deal of freedom of expression, and ranks “first place among Gulf states in terms of respect for individual freedoms, and particularly in respect to press freedom” according to Reporters Without Borders. Still, “defamation” and “attacks on religion” remain punishable by criminal law, while criticisms of high-ranking politicians and royalty remain taboo. In 2010, the Kuwaiti Ministry of Information shut down Al-Jazeera’s offices in Kuwait and withdrew its local staff’s press accreditation, accusing the network of “meddling in internal affairs” after it broadcast footage of police crackdowns on opposition protests and interviewed opposition members. The same year, Mohamed Abdel Qader Al-Jassem, a lawyer, writer, and journalist, was convicted of “defamation” after criticizing Kuwaiti Prime Minister Sheikh Nasser Mohammad Al-Ahmed Al-Sabah in his personal news blog. The conviction was overturned in January 2011 by Kuwait’s supreme court, but Al-Jassem still faced more court appearances over the same charges. In March a Kuwait criminal court suspended the newspaper Al-Dar and handed its editor-in-chief Abdul Hussein al-Sultan a six-month jail sentence for allegedly violating the Press and Publication Law by “undermining national unity” and “creating sectarian strife.” The paper had published several articles defending Kuwait’s Shiite minority from attacks by other writers. 4 Comments on "Kuwaiti Artist Shurooq Amin On Shutdown of “It’s a Man’s World” Show"
I watched Shurooq Amin being interviewed and was excited to see this wonderful woman. Kuwait and the Arab world should promote the women of their culture not hide them. We all know that men live in denial of what they think is correct behavior and what comes naturally to man. Living the high life whilst telling others how to behave. Demanding women are covered is not for God but because Men cannot tolerate anyone looking at their women. Its an Ego and control thing and stifles raw talent intellect and capability. Who gave permission for anyone to dictate what any grown adult can do. When you force a women to behave you cannot judge who she is or what she is capable of. This world stifles the beauty and Intellect of their women. Their culture controls them , when others sets them free, to be measured by their own actions. I have seen Men openly stating on television that a girl is like sweet that has fallen to the floor, if it is wrapped you would still want it, if it was not it would be soiled and no one would want it , how ignorant can you get, women are not commodities, they are created by God and are equal to men. They are not on earth for Mans pleasure. These men want women to be wrapped for their pleasure , whilst indulging themselves. God will judge me on my behavior but can only judge the jailers where there is no freedom.